Billy "The Kid" and his gang is wanted by the law, and when "Doc" Scurlock and Chavez are captured, Billy has to save them. They escape and set south for Mexico. "Let's hire a thief to catch one", John S. Chisum said, so he paid Pat Barrett, one of Billy's former partners, $1000 for the killing of William H. Bonney aka Billy "The Kid". 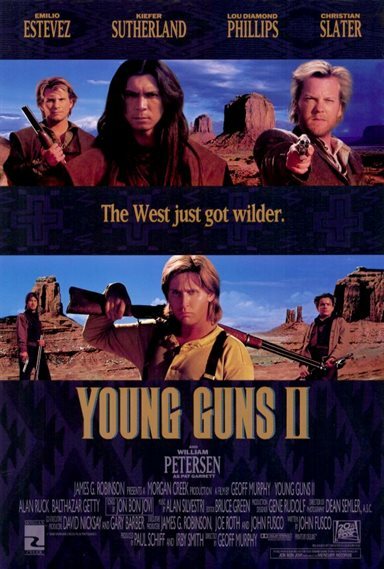 Young Guns II images are © 20th Century Fox. All Rights Reserved.